TALLAHASSEE, Fla. — #5 UNC Wilmington capped off a thrilling Sunday at Tally Classic with a 15-14 double game point win over Georgia. UGA was the surprise contestant in the tournament’s final game, having upset #10 Massachusetts 15-11 in semis. With the tournament on the line, they went toe to toe with Wilmington throughout the final. It was Georgia, in fact, who grabbed the game’s first break after a sloppy start for both offenses. Georgia turned it over three times on the first point of the game but eventually held. The Wilmington offense followed suit with a pair of giveaways, and Georgia was able to capitalize on the second. John Langstaff tallied the goal, setting the tone for his impact throughout the game. Langstaff was hugely influential for Georgia, scoring or assisting on a large percentage of the team’s goals. Wilmington wasn’t as reliant on as few players as Georgia to make plays for them, but Kevin Mateer did a lot of the driving for them. At 4-3, Mateer was key to getting the game back on serve. 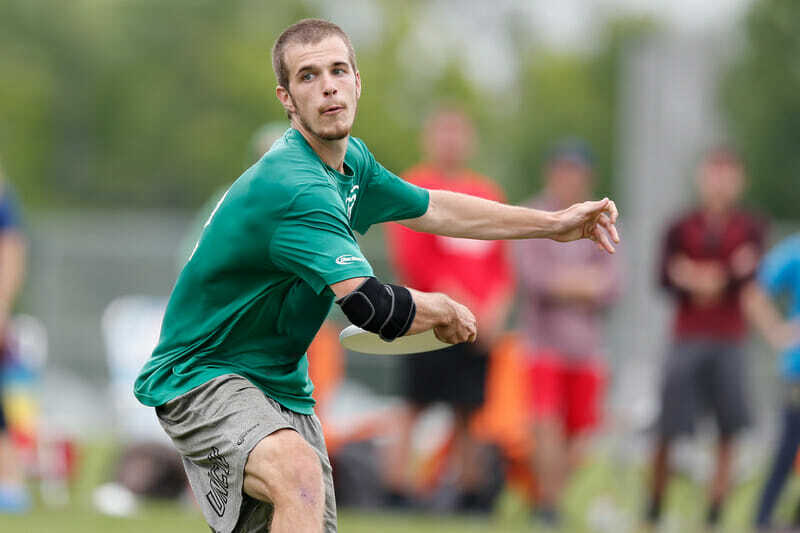 After a Georgia throwaway, Mateer blasted an upwind huck to Rick Hennighausen. Hennighausen did a lot of work to fend off fouls from a pair of Georgia defenders and make the grab, but it was an impressive throw into a steady wind. Mateer then got the disc back and broke the mark with a crisp inside forehand for the score. The teams were mostly even for the rest of the first half. Wilmington grabbed a second break on another long, sloppy point, with both teams making poor decisions and execution errors. Both teams’ D-lines had more chances for breaks they couldn’t convert. Neither team was playing exceptionally well, perhaps tired in their seventh game of the weekend, but both made some athletic plays. Wilmington carried the one break advantage into half up 8-7. UNCW grabbed a break on their first defensive point of the half to claim their largest lead, 10-7, after a wind-ruined huck and poor transition defense from Georgia. Georgia, however, got the break right back on their first chance to cut the lead to 10-9. Langstaff reasserted his dominance for Jojah over the next few points. His inside break forehands from the middle of the field opened up its width for his cutters, and Wilmington couldn’t contain them. Even with the wind fairly gusty by this point in the game, his throws led to a Georgia hold for 11-10, and then a break to knot the game up at 11. Despite claiming the momentum, Georgia started to unravel. A Hennighausen forehand bomb made it 12-11, and then Georgia dropped the ensuing pull. Though they got the disc back, Langstaff got a little too greedy with a couple of audacious throws into the end zone and missed with both. Wilmington eventually did get the break, upwind, for 13-11. And they broke again downwind for 14-11 after Langstaff tried to reset on the first throw of the point to Noah Li right as he was cutting away from the space to which Langstaff threw. In a flash, Wilmington had seized control of the contest. A game that had been neck and neck all game suddenly seemed over. “The wind also picked up a little bit, and made it a little more upwind, downwind than normal,” said co-captain David Petmecky. But Georgia overcame those factors to right the ship for 14-12, scoring on a perfect, laser forehand from Li to Sam Batson. And when Wilmington’s Willie Stewart’s high release forehand was too far for the open Hennighausen in the end zone, UGA was able to work it back into the wind with some incredible inside out break throws. An almost miraculous trailing edge catch from Hunter Cutts to save a IO break throw from Jones made the goal for the break to stay in the game at 14-13. Now Wilmington had to hold into the wind to win, and Georgia brought their best defensive intensity of the game. Their clammy zone pinned Wilmington on the goal line for about 10 throws and held Wilmington from ever getting out of their own red zone at all. Grayson Sanner was forced into a tough low release reset throw, and it was stuffed. A bladey forehand to Petmecky later, and Georgia had another break. 14-14, game to 16. Now in overtime, Georgia forced another turnover, but this time in their own red zone, facing the wind again. The hard cap horn blew with Georgia now in possession of the disc to make it double game point. Sanner atoned for his turnover a point earlier and blocked Langstaff’s reset to give Wilmington the disc back right on the goal line. They scored quickly to win the game, 15-14. It was a somewhat anticlimactic finish for the point to get capped into DGP halfway through, but, in the end, the team that had looked a hair better throughout the game ended up with the win. Neither team approached perfection, but Wilmington was a bit deeper, and when their top players made mistakes, they proved to be less costly. Wilmington head coach Brian Casey said after the game that he thought his young team’s inexperience showed a bit at times in the final, and that they didn’t take advantage of Georgia’s mistakes with enough efficiency. But in the end they were just good enough to hold off an impressive Georgia squad and claim their second consecutive Tally Classic crown. Comments on "With DGP Win Over Georgia, UNC Wilmington Wins Second Straight Tally Classic"